The Final Pulverizer is a big blue menace. 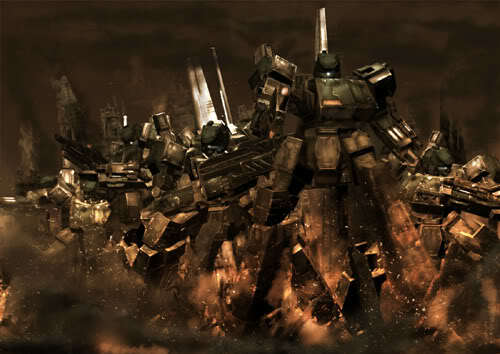 Fast, hard hitting, and nigh unstoppable for the rookies of Armored Core, it fittingly deserves the position of being the final boss of Armored Core Last Raven (Once the player unlocks all missions and ending paths). Granted there may be internal modifications, option parts, and tunes involved, it is still a fairly doable tactic in killing the final boss. Unless of course, the final pulvie decides to fly around instead of hopelessly trying to slash the player in the same place… Then we have a problem. Other ways we’d consider ballsy in killing the final boss would include bomb dispensers, rockets, and the SILKY energy machine gun. Thanks J.E. for the cool video. it maybe doable, considering that some of the most annoying enemies use the most basic and simple designs, and in the practice arena the basic AC gives you (the player) a run for your money, no matter how new/powerful/upgraded your personal AC is. He didn’t make any contact with the pulvarizer’s blade. Instead he is inches from it there for he is safe from damage. I was surprised that you can fight a pulvarized like this. If I knew that the pulverized AI isn’t that smart I would have just killed it with a close range weapon and some upgraded booster’s. This is just too good to miss. And I thought the AI would never do that but man oh man. I would now screw with the pulverized with just a close range weapon cause of this knowledge. If you excuse me I have a pulverizer to screw :D. It is ballsie, If I ever met a newbie and started teaching him how to beat the pulvarizer probably we’ll consider him a pro.